1. Wash your blueberries well, and pick off all the stems – or at least as many as you can find. 2.Place the berries into a heavy saucepan, and add 1/2 cup of water and the sugar. 3. Stir to dissolve and cook on medium high heat. As you stir, keep watching for stems and other detritus to pop up and carefully pick them out with a clean hand, before the syrup got too hot to handle. 4. Bring to a boil, then turn down to a simmer. You’ll notice that the berries continue to change color and texture. They’ll swell, some will break, and they’ll turn a deeper, richer purple. 6. Slowly pour the cornstarch mixture into the syrup, stirring constantly while you do so to ensure it all gets mixed in. Simmer for a total of 15 minutes or until the syrup reduces to the thickness you desire. 7. Add the lemon juice and stir to incorporate, then remove the syrup from the heat. Taste your blueberry syrup and determine if you need any more sugar. Add a teaspoon at a time until it taste right for you. 8. Now this step is totally optional, you can either strain out the blueberries as you put the syrup into a clean air tight jar or if you like a more rustic feel / cooked blueberries you can leave them in and pour the whole pot into a clean air tight jar. I use mason jars when it comes to storing the syrup for a long time because I know the seal is always effective and since they’re glass it won’t get stained by the syrup. I also keep a little in an oil/vinegar glass bottle for easy pouring. This is a pretty universal recipe feel free to switch out the blueberries for any berry you like or is in season. Feel free to use this on pancakes, waffles, on top of cheesecake. You name it you can put this recipe on it, it’s is a great little addition for when you want to change it up from normal syrups. For those that don’t know a simple syrup is used in a variety of beverages call for sweetening to offset the tartness of some juices used in the drink recipes. Granulated sugar does not dissolve easily in cold drinks or ethyl alcohol. Since the simple syrups are liquid, they are easily mixed with other liquids in mixed drinks, making them superior alternatives to granulated sugar while adding a nice little twist / sweetness. A wide variety of flavoring can be made, often in combination with each other, such as herbs (rosemary), spices (chipotle chilis; cardamom), or aromatics (orange peel; lemongrass; ginger). For instance, syrupus aromaticus is prepared by adding certain quantities of orange flavouring and cinnamon water to simple syrup. This type of syrup is commonly used at coffee bars, to make flavored drinks. Infused simple syrups can also be used to create desserts, to add sweetness and depth. Now that Summer is here I wanted to share a simple syrup recipe that works with any type of Summer berry that goes great into everything from cocktails to the everyday lemonade. 1. Combine blueberries (or whatever berries you are using), sugar and water in a saucepan set over medium heat, bring to boil. 2. Reduce heat, simmer 15 minutes, stirring occasionally. The blueberries will burst on their own, so don’t worry about chopping them first. 3. Pour through strainer, gently pressing to extract as much juice as possible; don’t press too hard, it’ll make your syrup cloudy! If you are using bigger berries like strawberries bump the recipe up to two cups instead of the one cup this recipe calls for. 1. Heat all of the blueberry sauce ingredients in a small saucepan over medium heat. 2. Allow to boil and then mash with a fork. 3. Turn the heat down to medium, simmer sauce on medium low until thickened. 4. Remove from heat and set aside to cool completely before layering in parfaits. 1. In a medium sized bowl beat the softened cream cheese for about a minute until smooth and creamy. 2. Mix in half of the sour cream until smooth then add the remaining half, along with the vanilla extract and heavy cream. 3. Continue to mix until smooth. Slowly add the powdered sugar until everything is well combined. 1. 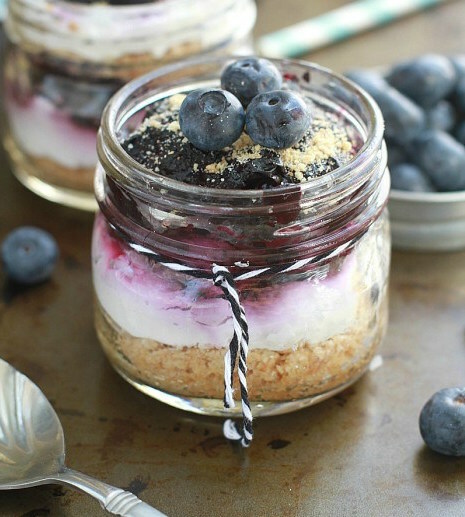 Start the parfaits by layering 1 to 2 tablespoons of the graham cracker crumbs on the bottom of each serving glass or jar. 2. Add the cheesecake mixture, and blueberries in alternating even layers. 3. Top with fresh blueberries and any other berries of your choice. 4. Store in refrigerator allowing to set for at least 30 minutes. For a healthier option switch out the sour cream for Greek yogurt and use 1/2 fat or light cream cheese. Feel free to switch out the blueberries for any berries you personally enjoy.